Industrialist Sanjay Dalmia on Wednesday announced Dalmia group's entry into the healthcare sector through the launch of Dalmia Medicare which is currently aggregating diagnostics centres. The group also seeks to aggregate nursing homes and pharmacies, among others. "The Indian healthcare industry is growing at an exponential rate but there is still healthcare deficit in the country... With Dalmia Medicare, I wish to create a platform that brings good health to every home. Starting with NCR, we will have our presence across India in the next two years," Dalmia said at a press conference. 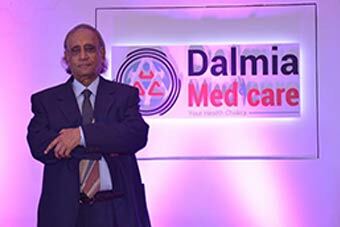 Dalmia Medicare, which is housed under Dalmia group's subsidiary Dalmia Biz Pvt. Ltd, currently has 32 diagnostics centres in Delhi/NCR, Dalmia said. It aims to have over 300 diagnostics centres by the end of this fiscal in the region, he added. Dalmia Medicare is helping the diagnostics centres in branding and promotion, and upgrading technology. It has a revenue sharing agreement with the owners of the diagnostics centres, Dalmia said without giving out the financial details. The Dalmia family has brought in the entire capital for the business, but Dalmia declined to share the amount. Dalmia said he only has a supervisory role in Dalmia Biz. Dalmia Biz is led by Vivek Gupta, who is the CEO of the company. Prior to joining Dalmia Biz, Gupta was Business Head - NDD of online marketplace AskmeBazaar. Gupta, an alumnus of IIM Bangalore, has also worked with companies including Coca-Cola, American Express and study search platform Hotcourses Ltd.
Dalmia Biz also aims to enter into other verticals like education, retail, finance, travel & tourism, real estate and hospitality. "The next vertical we are targeting is education which we aim to float next year," Dalmia said. "The details of the launch of other verticals will be decided later," he added. This is Dalmia's second attempt to mark its presence in the retail space. In 2006, Dalmia's group company GHCL had acquired UK-based financially troubled home textiles retail chain Rosebys for $40 million but he firm later had to shut it down. Dalmia, a former member of the Rajya Sabha, has been the non-executive chairman of GHCL since January 2005, He also served as chairman of another group company Golden Tobacco Ltd, a tobacco related products provider, till 2014.